Weather got us a couple days this week, but the days we have been able to get out have been outstanding! With large tides this week we were still able to pull out some very nice fish. 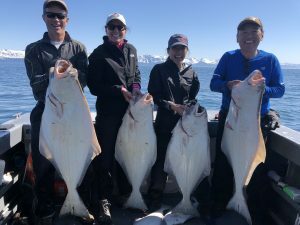 Lots of fish in the 30-50 pound range were caught with loads of yellow eye, black rockfish and kelp greenlings also being caught. Unfortunately all of the lingcod had to go back in the water until July 1st. Check out our Facebook Page for daily pictures of our daily catches. There are not many spots left for June and July so book now as I do not expect them to last long. Happy Fisherman on the M/V Saltwater Addiction.